Date Night loves it when small towns fix up their downtown areas. 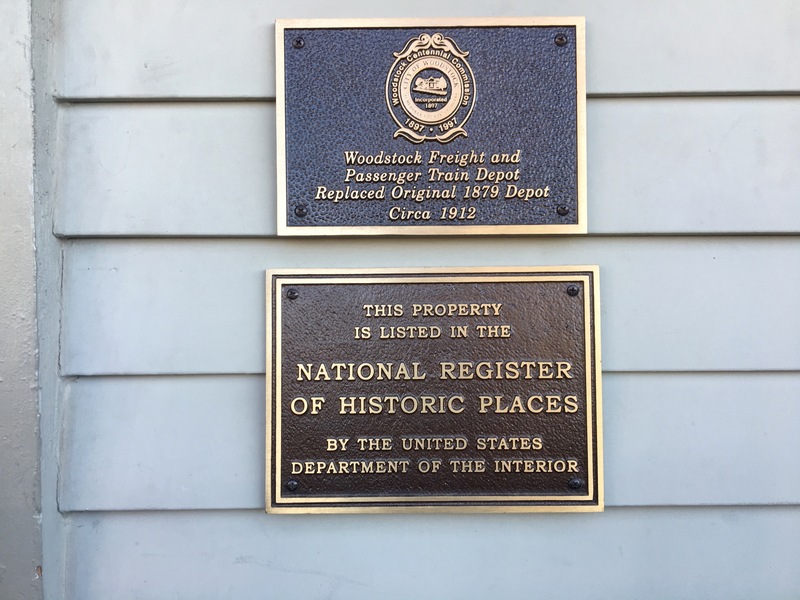 One place that has done a fantastic job of making its downtown a “destination” is Woodstock, which has assembled a great array of restaurants and entertainment in an area that used to be rather “blah”. It’s always hard for us to get to Woodstock because of traffic, but tonight we beat the rush. However, we find ourselves at Freight at the unworldly hour of 4PM. 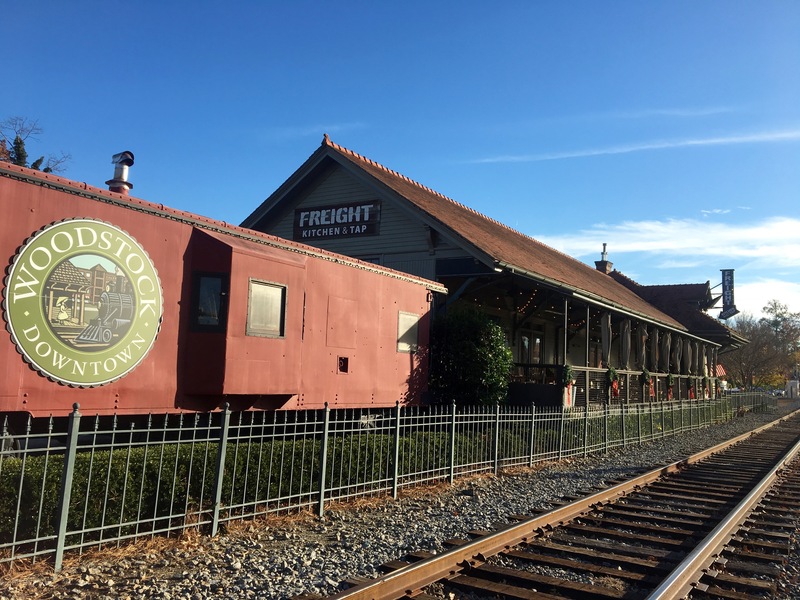 Isn’t this nice–they have taken the old railroad station and turned it into a restaurant. It’s been around for over one hundred years. Back in 1912, the same year the Titanic sank, we would have been doing this blog on the Mutual Radio Network. 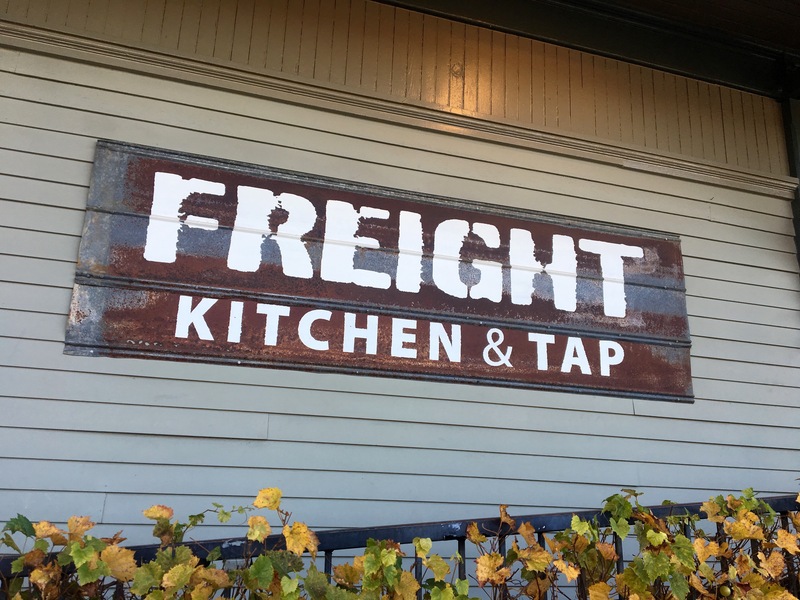 The official name of the restaurant is Freight Kitchen and Tap. They have 22 taps, which we are happy to say are filled with mostly-local beer. You can belly right up to the bar when you walk in. During our visit, the bar was getting a lot of action. Reformation Brewery is only one mile from here. We joke that they must have a direct line from the brewery to the restaurant as four of their beers are on tap. 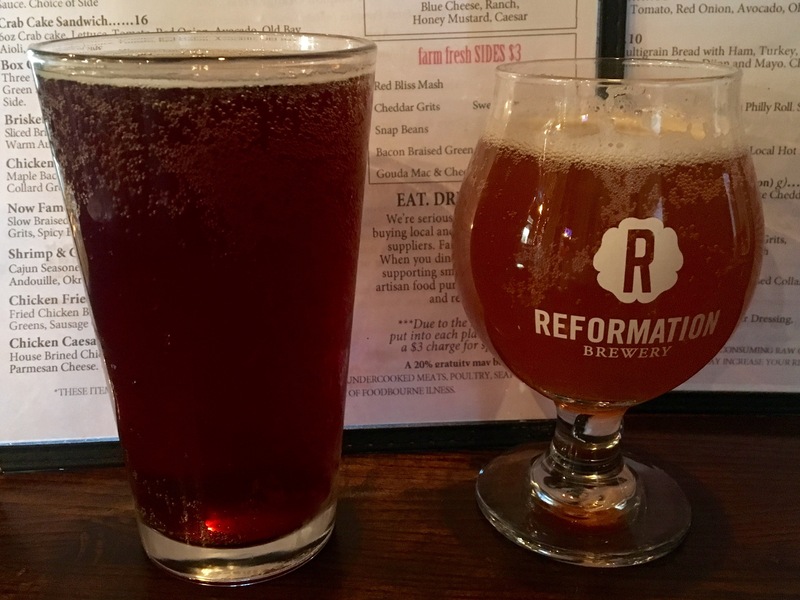 Turns out Freight is one of the first places to serve Reformation. The dining room sticks with the “old train station” theme. It’s nothing fancy, but it works perfectly with the building. That’s a Cadence on the left and a Providence on the right. Both are two of our favorites, and we are glad we can order the local stuff. The Providence is over 9% ABV, so that’s why it comes in such a small glass. The Cadence is probably the price performer of the two. We have not had lunch today, which means we plunge right into the appetizer menu with something called “Addiptive”. 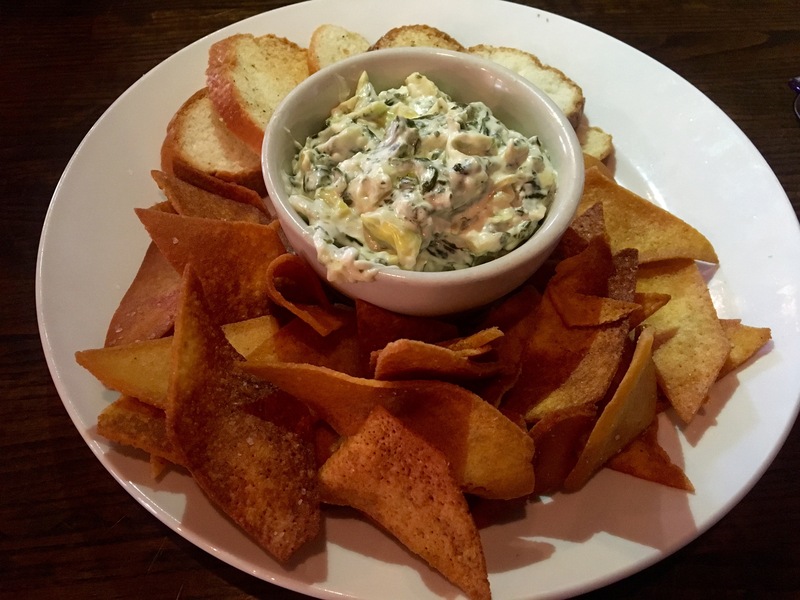 It’s a dip, spicy spinach and artichoke to be exact. It’s served hot, but not really that spicy, which is fine with us. Here’s a nice touch–the cornmeal crepe chips that are made right here. They are thicker and crunchier than tortilla chips and don’t break when you plunge them into the steaming bowl of dip. This did not last long at our table. Arriving at 4PM does create a menu conundrum. The lunch menu goes until 5PM, when the dinner menu starts. Do we waste time with our beer and addiptive, or plunge right into the lunch menu? The menus are pretty similar, so we stick with the lunch menu, although both of our choices are also available on the dinner menu at the same price. 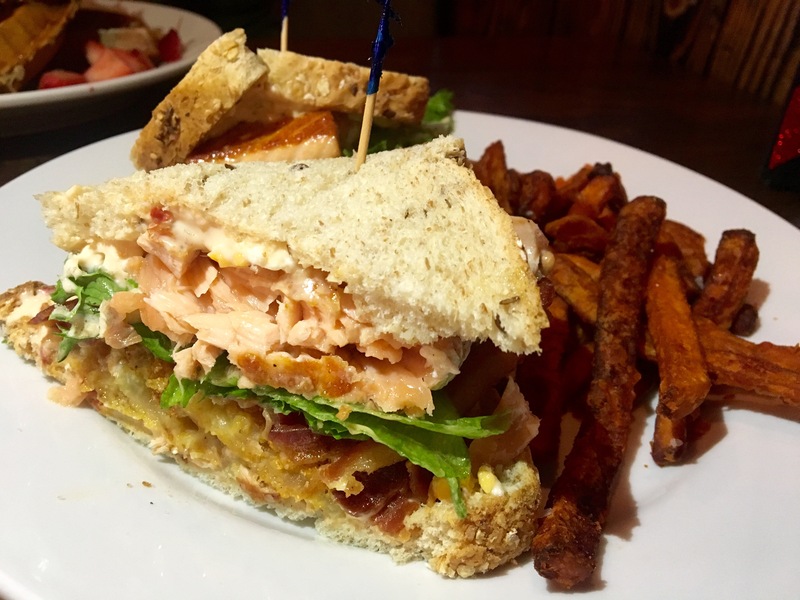 Eve gets the salmon BLT. The “T” is a fried green tomato. The “B” is thick, crisp bacon. The salmon is nice and moist. Unfortunately, the multi-grain bread this comes on can’t stand up to the heft of the sandwich. This quickly becomes a hot mess with soggy bread that does not get eaten. They might want to re-think their bread, going for something a little sturdier like a baguette. The side order of sweet potato fries is crunchy and nicely cooked. Sometimes sweet potato fries come out soggy, but Freight cooks these longer, which gives them a crispy texture. If chicken and waffles are on the menu, I’m usually interested. Note the strawberries on the plate, which makes this healthy eating. The chicken breast is moist, hot and crunchy and topped with a small amount of honey. Not enough honey if you ask me, but there’s maple syrup on the side to add extra sweetness. Unfortunately, the waffle is as cold as a Canadian cold front. I complain and no more than a minute later, I am presented with a hot waffle for my chicken. Makes you wonder why the cold waffle was served in the first place if a hot one was only a minute away. I will never understand what goes on in restaurant kitchens sometimes. 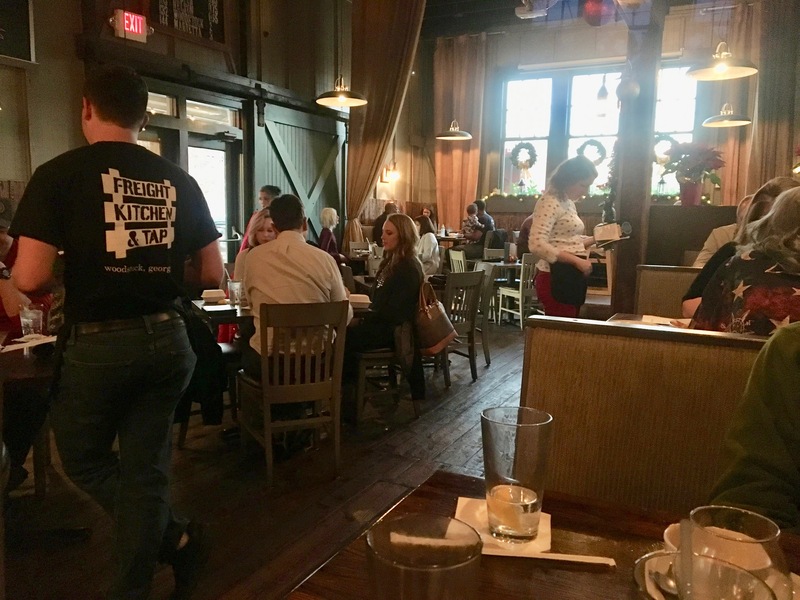 The bottom line on Freight Kitchen and Tap: Loved the building and loved the beer list. It’s a good thing we don’t live closer, or we would be regulars at the bar. 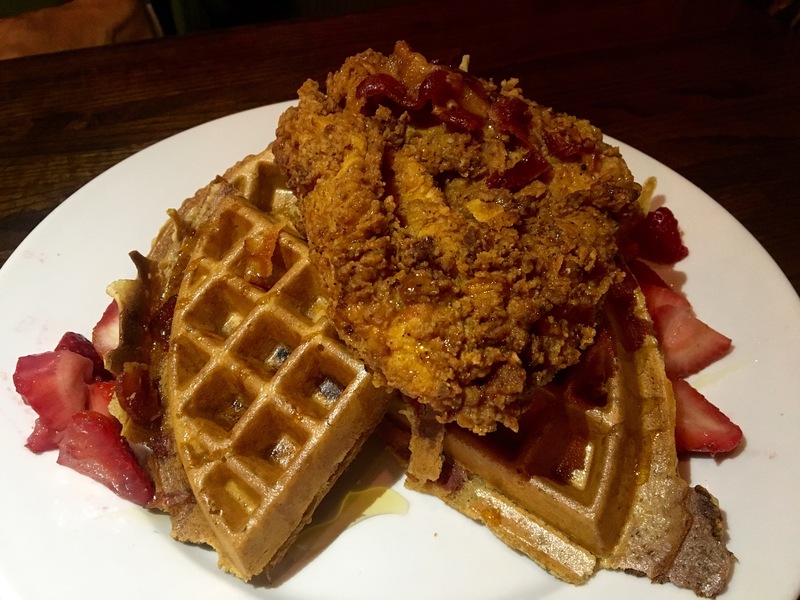 The food was good, but the execution (soggy bread on the BLT and an ice-cold waffle) should have been better for what they charge for their entrees. 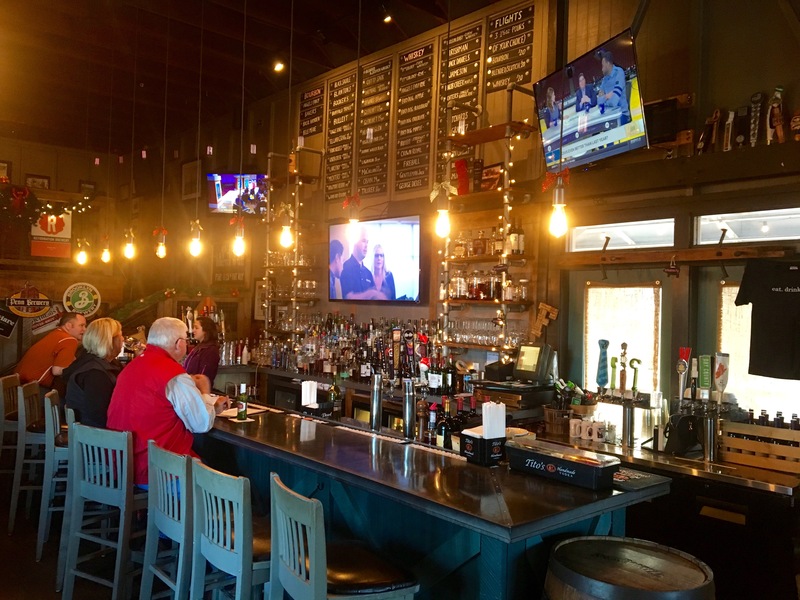 With the Century House and Reel Seafood within shouting distance, Freight needs to step things up in the kitchen if they want to be mentioned as a “must visit” in Woodstock.